This entry was posted on June 10, 2015 by Posturite. Last year, almost 630,000 injuries occurred in the workplace, 148,000 of which led to people taking seven or more days off work. Around 23 million working days were lost to work-related ill-health and a further 4.7m to workplace injury. The cost to the UK economy was a staggering £14bn. Statistics like these bring into sharp focus the important role that qualified first aiders can play in helping to bring down the huge personal and economic costs of workplace ill-health and injuries. Accidents and illnesses will always happen even in the best ordered circles. But when they do, it helps to know that there are people on the premises capable of dealing with the immediate situation and, hopefully, reducing its potential seriousness. 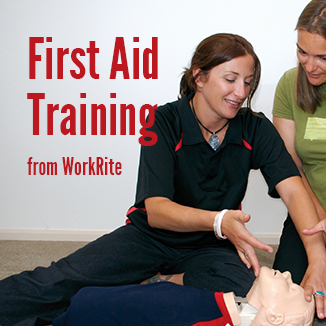 Each year WorkRite trains hundreds of people to be able to provide first aid in emergency situations by helping them to achieve a Level 3 Award in First Aid at Work. The three-day course is based on the HSE training standard for delivery of First Aid at Work courses for the purpose of the Health and Safety (First Aid) Regulations 1981 (Northern Ireland 1982) and is designed to enable delegates to attain knowledge and competencies needed to deal with a range of emergency situations. The qualification comprises of two mandatory units with a total of three credits and 24 guided learning hours. Written assessments are undertaken on the first and third days while practical skills are assessed continuously. A large range of potential accident and emergency situations are covered including cardiopulmonary resuscitation, choking, external bleeding and hypovolemic shock, hypoxia, chest injuries, burns and scalds, shock, angina and heart attack, sprains and strains, diabetes, epilepsy, poisons, anaphylaxis and fractures and dislocations. Only 12 delegates are allowed on each course to ensure that each person attending receives the maximum personal attention and tuition. To find out more about the Level 3 Award in First Aid at Work and all our other first aid courses, click here to visit our website or call us on 0345 345 0030.